It’s been almost a decade since The Lord of the Rings last appeared on the big screen. A lot has changed in that period of time, especially concerning the director the studio and lawsuits and negotiations over the content. Add in budget negotiations, timetable struggles and a director backing out, The Hobbit has probably undergone one of the most difficult journey’s too get made. On Tuesday night, fans were surprised with the trailer release: proof it’s finally here. In that amount of time there has been another interesting development: the rise of 3D technology and director Peter Jackson’s recent involvement in it while producing Tintin with Steven Spielberg. Jackson admits he is excited to work in 3D and would have jumped at the chance to film his past franchise in it had he had the opportunity. Without having seen the trailer in 3D, it’s hard to comment on his implementation. The Hobbit trailer really doesn’t tell us much of what we don’t already know about the story and how exactly the notorious screenwriting plans on venturing the material (and new material outside the book), but we are introduced to our new set of characters, who seem well cast — the strength of the series was a key reliance on the relationship of its characters, so we can expect the same for these next to perhaps. Importantly, we can rest easy knowing that Martin Freeman appears to be a proper fit for the young Bilbo Baggins, and is welcome in the hobbit family. The lengthy teaser didn’t do much to address the plot for those who are unfamiliar, show dedicated fans how Jackson is attempting to create larger subplots for his LOTR characters or what the battle sequences may look like, but it did reassure that this is the same Middle Earth and characters in another time. 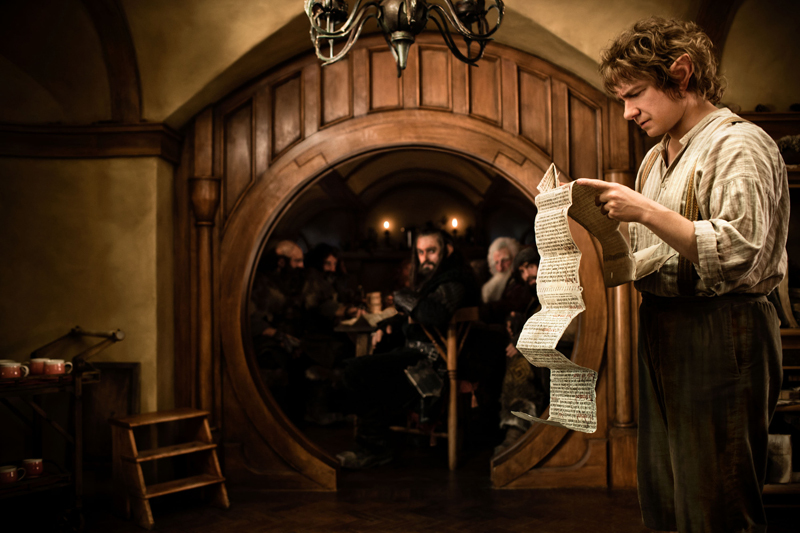 The Hobbit will appear in two parts, one released in December 2012 and the other a year later. Highs: The trailer is expertly assembled. The best technical components of LOTR (nearly all given Return of the King’s record-tying 11 Academy Awards) are all present here and tonality is achieved to its fullest. The trailer also features one of Tolkien’s songs, “Misty Mountains,” which gives the trailer an enchanting rhythm. Lows: Missing are some key elements that would normally be in a full trailer, like exposition and conflict. The obligatory inclusion of a peering Gollum at the end of the trailer disrupts its pace and serves little purpose given we’re already familiar with the character. Regardless of these flaws, fans are without a doubt going to be pleased to be reunited with their beloved franchise. This entry was posted in Trailer Reviews by LukeMiller. Bookmark the permalink. Every couple of seconds it changes – up an eighth, down an eighth -it’s like playing a video slot. I lose $20 million, I gain $20 million. For many people, the weekly paycheck is ‘take-home pay’ because residence is the sole place they can manage to choose it.